Ironically, given it's the 2013 model, the Les Paul Studio feels a little bit dated. Fortunately, the real talking point here is the Min-ETune functionality. Min-ETune works well and is discreet and easy to use. Although 1952 was the year that the Gibson Les Paul first arrived on the market, Gibson has chosen 2013 - the, erm, 61st anniversary of the guitar's introduction and the 98th anniversary of the birth of Lester William Polsfuss - to celebrate the iconic musician's love of guitars with The Year Of Les Paul. What this means, in practice, is a boatload of new versions of the guitars that originally carried his name: the Les Paul and SG. "2013's iteration of the popular Les Paul Studio throws coil-splitting into the mix for increased sonic versatility"
The guitar on review is 2013's iteration of the popular Les Paul Studio, which throws coil-splitting into the mix for increased sonic versatility. In keeping with it's updated nature, the 2013 Studio features Gibson's Min-ETune system - the firm's latest take on mechanical self- tuning for electric and acoustic guitars. Developed with German company Tronical, the headstock-mounted gears are the next generation of Gibson's 'Robot' technology. The whole Min-ETune system - tuners included - sits on a thin black rectanglular plate that covers most of the rear of the peghead. The weight impact is negligible and visually, it's very discreet, too. You can still tune the pegs by hand (though it's slow going), and operation is reassuringly simple: switch the unit on, strum all open strings and watch their respective LEDs. The LEDs corresponding to the strings that are in tune will turn green. Now, pick any individual strings that have red LED readouts until every string is brought to the desired pitch, after which the unit switches off. Even with wayward tunings, the whole process takes around 15 seconds, and the unit is accurate up to two cents. The procedure outlined above is for standard tuning, which is barely scratching the surface of what the Min-ETune can do. 12 altered tunings - including DADGAD, open D and open G - are roughly 30 seconds away via the unit's four-way cursor, and you can create your own tunings and store six of those. The Min-ETune is a really big step forward for automatic guitar tuning. After the stripped-down fun of the recent Les Paul and SG Tribute models, switching to the 2013 Les Paul Studio, it's difficult to get quite so excited. The Studio model of old was a staple for gigging guitarists in the 1980s and 90s who longed for the 'real thing' - Les Paul Standard - but simply couldn't afford it. 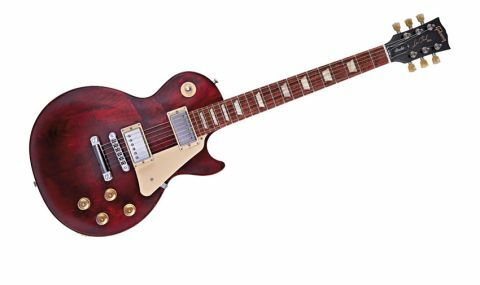 However, the abundance of more interesting and arguably more vibe-y Les Pauls, such as the Tribute models, in the affordable end of the recent Gibson catalogue makes even this updated Studio seem a little dowdy in comparison. That said, both the Goldtop (with no upcharge in this instance) and the Vintage Sunburst Studios are a little racier in appearance. Anyone who has read much in these pages or elsewhere about Gibson's adventures in the timber yard in recent years might presume that the rather anaemic hue of the Studio's fretboard identifies it as baked maple, but that isn't the case. "The slim 60s neck profile is a decent palmful"
Close inspection reveals a similar grain to rosewood, while the identity of the material is in fact granadillo, indigenous to Central and South America and often used interchangeably with cocobolo and rosewood in other industries. Its natural properties make it perfectly acceptable as a fretboard wood, but, traditionally, Les Pauls have usually featured a darker-toned 'board and that's the way we, and many others, have been programmed to like it. Compared to, say, the recent Les Paul '50s Tribute, the acoustic response of the Studio is a little softer and less airy - most likely due to a combination of extra weight and the thicker gloss finish - but it's still no shrinking violet, and over the years we've played several Standards that have felt much less lively when played unplugged. The slim 60s neck profile is a decent palmful, and the slightly higher price when compared to those aforementioned Tributes seems to have translated into a little more attention to detail at the fretboard edges. It's a little disappointing to find the 2013 Les Paul Studio so, well, ordinary. There's nothing wrong with its sonic performance - indeed, the coil-splits bring some interesting slimmed-down tones to the table. However, the combination of 490R and 498T humbuckers in a Les Paul sounds a little tired and one-dimensional to our ears, especially when we compare it with the musicality of the BurstBuckers on the recently reviewed '60s Tribute SG - a guitar that costs £350 less than the Studio. Ironically, given it's the 2013 model, the Les Paul Studio feels a little bit dated. Fortunately, the real talking point here is the Min-ETune functionality. Some players will sneer at the mere idea, of course, but anyone who does a lot of studio recording or uses multiple tunings in a live scenario should check it out without delay.